As early as 7 a.m., Morong, Bataan residents carrying empty plastic bottles and containers trooped to the Municipal Covered Court to take part in Refill Revolution, a program of the Department of Energy and Natural Resources – Environment Management Bureau (DENR-EMB) Region III that aims to reduce plastic consumption by encouraging households to recycle. The country’s top condiments maker NutriAsia, Inc. participated once more in the program as one of the manufacturers that refilled plastic bottles and containers with products at discounted prices. NutriAsia was among the first companies that supported Refill Revolution during its inaugural leg in Guiguinto, Bulacan in April 2018. According to Employee Council head Emerson “Butch” Mogueis, employees from different departments readily signed up as volunteers to the event because they saw it as an opportunity to participate in one of NutriAsia’s corporate social responsibility projects. 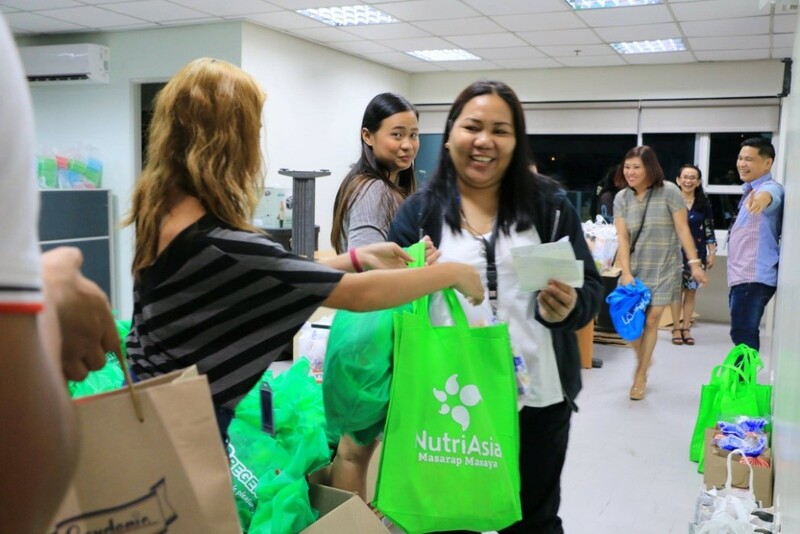 “As employees of NutriAsia, we are happy to be part of this activity where we were able to promote recycling which is good for the environment. At the same time, we are able to provide Morong residents with soy sauce and cooking oil at big discounts of up to 50 percent,” he said. Morong Mayor Cynthia Estanislao praised NutriAsia for being a big part of the successful Refill Revolution in the town, which was attended by about a thousand residents. “We thank NutriAsia for their generosity in giving our residents big discounts on their products, which are staples in every household. We hope they can join us in our future activities where we wish to replicate DENR-EMB’s Refill Revolution through our cooperatives and other commercial establishments,” she said. Prioritized in the recycling activity were indigent beneficiaries of the government’s Pantawid Pamilyang Pilipino Program (4Ps). With just a total budget of P135, each 4Ps beneficiary who went to the Refill Revolution was able to buy one liter each of soy sauce and cooking oil from NutriAsia, and liquid detergent and fabric conditioner from other manufacturers, as well as one kilogram of powder detergent. “Masaya po kami dahil malaking tulong po ang discount na nakuha namin ngayon mula sa mga kompanya na namahagi ng kanilang produkto gaya ng NutriAsia. Nakakatulong din po sa kapaligiran ang ginagawang pagrerecycle ng mga lalagyan (We are happy because being able to avail of big discounts from companies that participated in the refilling activity is really a big help for us. Recycling of containers is also good for the environment),” said Kristy Vistan, a 4Ps beneficiary who is currently pregnant and has three kids with her fisherman-husband. For her part, DENR-EMB Regional Director Lormelyn Claudio said that NutriAsia has been one of their important partners in the initiative. “We hope that this recycling program becomes bigger than a one-day event. We hope NutriAsia can have more refilling stations in the future, and that they will be able to participate in our future events as well as similar events as Refill Revolution gets replicated by local governments and establishments,” she said. Founded in 1991, NutriAsia is a powerhouse of beloved, timeless, and iconic Filipino food brands that include UFC, Papa, Jufran, and Mafran Catsups and Sauces; UFC Cooking Sauces and Meal Mixes; Mang Tomas Sauce; Datu Puti Vinegar, Soy Sauce, Fish Sauce, and Adobo Series Sauces; Golden Fiesta Cooking Oil; and Locally Blended Juice Drink and Merci Buco coco water. Morong, Bataan residents lined up at the NutriAsia station to get their containers refilled with Datu Puti soy sauce and Happy Fiesta cooking oil. 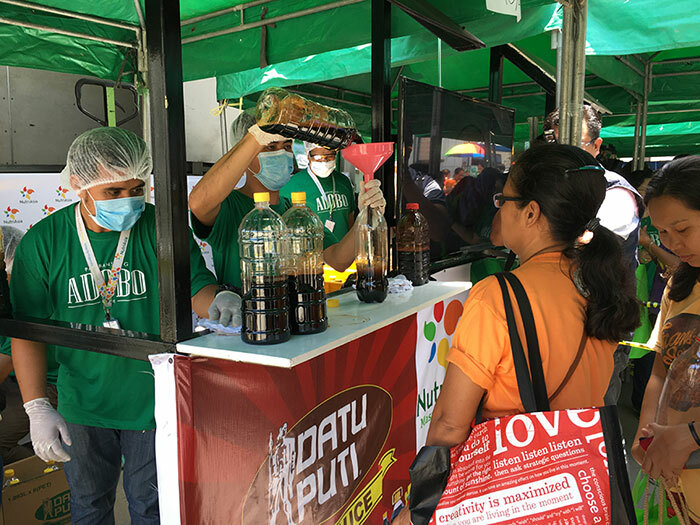 NutriAsia’s refilling station at the sixth leg of DENR-EMB’s Refill Revolution was a showcase of proper handling and sanitation of food products. NutriAsia refills a customer’s container with one liter of soy sauce. NutriAsia employee Emerson “Butch” Mogueis receives from Mayor Cynthia Estanislao and DENR-EMB Regional Director Lormelyn Claudio a plaque of appreciation for NutriAsia’s participation in the sixth leg of the Refill Revolution in Morong, Bataan.